Now it counts. 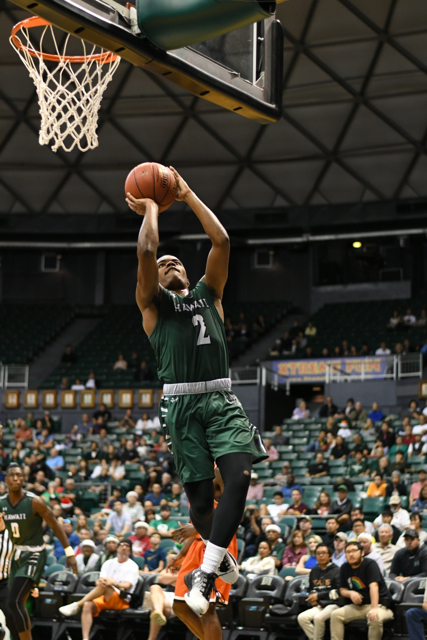 After numerous “preview” showings, the University of Hawai’i basketball team will officially open its 2018-19 season on Friday, when the Rainbow Warriors host Portland on the opening night of the Outrigger Resorts Rainbow Classic. Friday’s game is scheduled to start at 7:00 p.m. in the Stan Sheriff Center, following an earlier Rainbow Classic game between North Texas and Humboldt State (scheduled to start 4:30 p.m.). The three-day tournament will continue with games on Saturday and Sunday. Hawai’i is scheduled to play at 7:00 p.m. on Saturday, and 6:00 p.m. on Sunday. All Hawai’i games will be televised on Spectrum Sports (channel 12). The Warriors have had more time than usual to prepare for this season, thanks to a “Down Under Tour” to Australia in August. 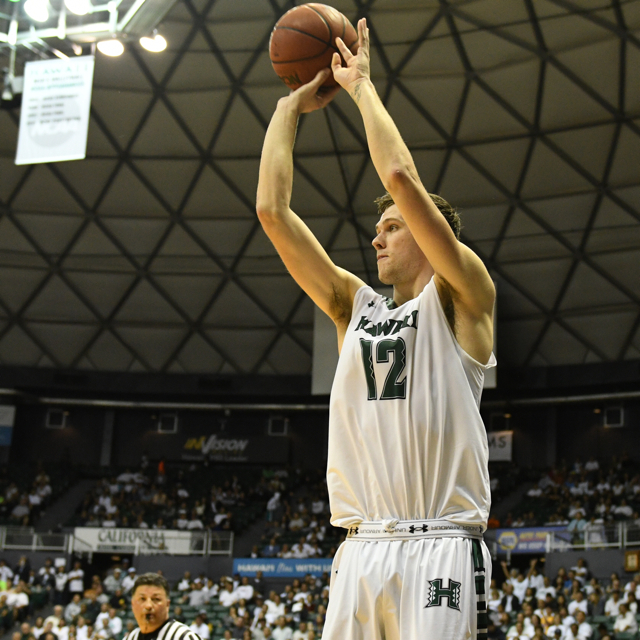 That trip included four exhibition games, and the Warriors also scored an impressive 81-45 exhibition win over NCAA Division II neighbor Hawai’i Pacific last week. Stepteau is one of several key returnees from last season’s 17-13 team. Nine players started at least one game last season, and seven of them are back this season — guards Stepteau, Drew Buggs, Sheriff Drammeh and Leland Green, and forwards Jack Purchase, Zigmars Raimo and Samuta Avea. The top two post players from last season – Mike Thomas and Gibson Johnson – graduated. However, three 7-foot freshmen have been brought in to fill the void. Mate Colina and Owen Hulland were recruited out of Australia, and Dawson Carper is from Colorado. Eddie Stansberry, a 6-2 junior guard, transferred from San Francisco City College and is expected to add instant shooting to the mix. Friday’s opening opponent, Portland, appears to be an offensive-minded team. The Pilots scored a 111-103 victory Multnomah (Ore.) this week. Although Multnomah is a NAIA program, the game counted as an official win for Portland. In previous weeks, Portland won two exhibition games, and scored 94 points in each win. Josh McSwiggan, a 6-foot-7 junior forward from England, tallied 37 points and 11 rebounds in the win over Multnomah. He shot 17 for 25 from the field. Marcus Shaver Jr., a 6-2 sophomore guard and former Hawai’i resident, added 23 points, nine assists and six rebounds for Portland. He led the team in scoring last season with 12.3 per game. Franklin Porter, a 6-4 junior guard, had 14 points, seven rebounds and six assists in the win. He is the son of head coach Terry Porter, who is a former NBA point guard. The Pilots finished 10-22 last season, including 4-14 in the West Coast Conference. Despite returning several key players from last season, the Pilots are picked to finish 10th (last) in the WCC Preseason Poll. ‘Iolani School graduate Hugh Hogland, a 6-10 redshirt freshman, is expected to play a reserve role for the Pilots this season. Television: All Hawai’i games will be live on Spectrum Sports – Channels 16 (SD) and 1016 (HD). Ticket Information: Upper Level – $30 all seats; Lower Level – $18 or $20 for adults, $16 or $18 for senior citizens (ages 65 and older), $5 or $7 for students (ages 4 through high school). Upper level prices vary by section. UH Manoa students free with validated ID. Parking is $6. Late night with the Warriors: Season opener at 11 p.m.